Late last year, I met up with a new co-worker of mine. He recognized me back in office, when he remembered seeing me at a recent Annual General Meeting (AGM) for a company that I invested in. So we had a lunch date. When I met him for lunch, I noticed he drives a big car, a vehicle that is more fitting for a director than your typical engineer. That puts a question in my head, whether an engineer can get rich working for a long time, or that being a stock investor is able to get us a nice life like that. Always curious about another investor’s thought process, I asked him about his investment process. And I came away not having a good idea about his investment process. He shared with me that he was punting stocks for the longest time in a haphazard manner, until an old timer told him how important dividends are. He works hard to understand the businesses, the opportunity that some stocks provides and size up the company by attending AGMs. Yet in the countless of investing tales shared, it was littered with many stocks that I doubt I would consider them as dividend stocks, or that they were sold too fast, which feels to me like short term trades. What pained me was the stories of the big losses he incurred for investing in some high dividend yielding companies, oil and gas companies. If you make a 5% portfolio loss, you need 5.2% gain to make back your capital. If you make a 30% portfolio loss, you need 42.8% gain to make back your capital. Having large draw-downs hurt, whether you invest for dividends or not. I have seen how my co-worker’s way of investing in dividends many times. What they relied on are the “golden lessons” from some gurus within their circles. The problem is that these plans can be rather half baked. They worked when things are very nice, when everything is going up. However, they do not help you question whether the stocks can continue to pay dividends, yet have good capital appreciation. Rickmers Maritime was a business trust that provides a dividend yield of 10% at $0.30. They have to severely cut down on their dividends because the ships that was chartered out in the past at a high rate, could only be chartered out at a fraction. 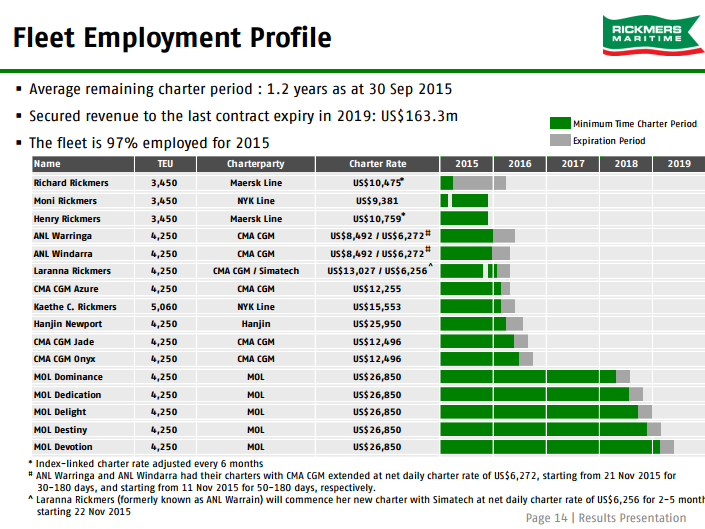 I written a little bit about this in the past, these slides was provided by Rickmers Maritime. It is not hidden information. It gives us an idea very clearly what are the potential headwinds coming for Rickmers. You would be able to steer away from this. Asian Pay Television Trust is another stock that provides 10% dividend yield. It is also one he has vast holding in. 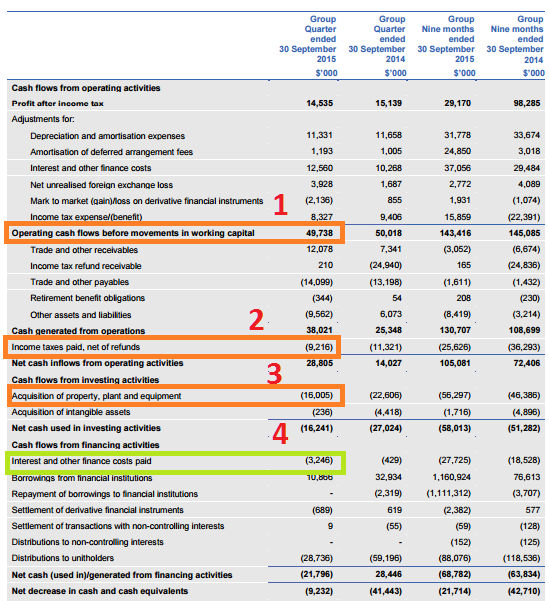 APTT’s ability to continue to pay a high dividend per share can be easily identified if you look through its cash flow statement. I written about it more in detail here. Some financial ratios, and key metrics made me look at these good dividend stocks in a different light. I see them as unsustainable dividend payers that will take a hit either sooner or later. These financial ratios and key metrics are not rocket science, but they are the things that prevent you from going 200 km/h and killing yourself. Do they prevent you from investing in all of these problematic dividend stocks? No. But it eliminates you from a whole number of them. Despite the setbacks, what I learned from my co-worker is that you can have a different way of living your life. His life was about being very hard charging at work for a long time, as the nature of work demands of him. All this starts crashing down to earth when he encountered health problems due to neglect and the stresses of work. He came to a realization that not being dependent on his main income cash flow, building up assets that provides an alternate form of cash flow can provide the optionality in life. He could say no to the promotion that increases his pay BUT also increases his stress level. He chose to take advantage of a stable job to channel as much as he could so that he becomes less dependent on it. It is perhaps why he could afford a car that is boss level. My friends Rusmin and Victor started Dividend Machines some time ago, focusing on providing the necessary resources for investors who wants to invest in dividend stocks to be well equipped to deal with that. The final module ties everything together and shares with you how to manage the stocks from a portfolio perspective. Dividend Machines will organize all access workshops that allows you to talk with the trainers and revisit the curriculum. In 2016, Rusmin and Victor hosted 8 such sessions last year and if you are a Paid Member, you have access to these workshops. Dividend Machines comes with a price tag of US$297.00 or SG$421.00. On an $8000 worth of stock, SG$421 could be a potential 5.2% loss. Gaining the knowledge might help you avoid the mistake, over and over again. I wonder if my friend would prefer not losing $70,000 last year if he could have avoided this by understanding some nuances of dividend investing if he could enroll into something like dividend machines. The course closes on 27th February 2017. This means you have a small window of 11 days to sign up. “is this vendetta clouding their judgement” may have explained this reaction. I have also seen how Kris energy bondholders reacted and their emotions ran high. Kyith, hope you are not affected by this. Dividend machines teaches you how to avoid fraud companies that pays high dividends to attract investors. Hi My Sweet Retirement, thanks for the endorsement! Thanks for your article Kyith, keep up the good work.